Good content often also speaks with pictures. Many pictures are a perfect fit to rank in Google and thus generate further traffic for your website. That is why it is helpful to track the rankings of your pictures, which enables you to specifically optimise these pictures, to raise their rankings. The SISTRIX Toolbox has a number of features available in the “Universal-Search Module” that allow you to do quick analyse the picture search, Google Maps and other Google services. You start out by typing in a domain, subdomain or URL into the searchbar in the top right of your Toolbox. Next, please click on “Universal Search > Overview” in the left-hand navigation. Here, you will already see the keyword history as a chart. If you hover your mouse cursor over the lines on “Keyword – Development” you can see the exact number of keywords for which we were able to find Universal-Search results in the respective week. The specific keywords for which we found picture rankings for your page can be found in the Universal-Search Module of our Toolbox by clicking on “Pictures”. There, you will also get a single chart that gives you an overview of the historic development for the domain. For the search term “Meteoriteneinschlag” (meteorite impact) you can find a picture from “spiegel.de” in the picture search. You will see two columns in the toolbox that show a position. I would like to quickly explain this by using an example. The column “position” shows the row the picture is in. The following column “Position intern” tells you which picture within this row is the picture in question. For our “meteorite impact”, SPON (Spiegel Online) ranks in the first row on the fifth spot. On the screenshot, you can see a total of three rows. Back in the Toolbox: In the column “Traffic” you can get an idea of the pictures potential. The next column (Traffic Trend) shows you the seasonal dependency of the search requests. You can also sort the results by clicking on the header for that table, above each column. This enables you to quickly sort for the picture rankings with the highest traffic potential. For the example “Spiegel.de”, this sorting leads us to the term “Angela Merkel”. With the name of the chancellor, spiegel.de ranks in row 4, position 2. The picture integration on SPON simply consists of a gallery with only a short description below the picture. Also SPON has more pictures of the chancellor in the gallery, which enables the site to take up more rankings in the picture search. These, however, change regularly. With a few optimising measures, the full potential of the picture could be used to gain more traffic for their website. Google prefers picture sizes that are in themselves quite expressive and offer something meaningful for the user. That usually counts for pictures with a size of at least 300 pixels (length or width). 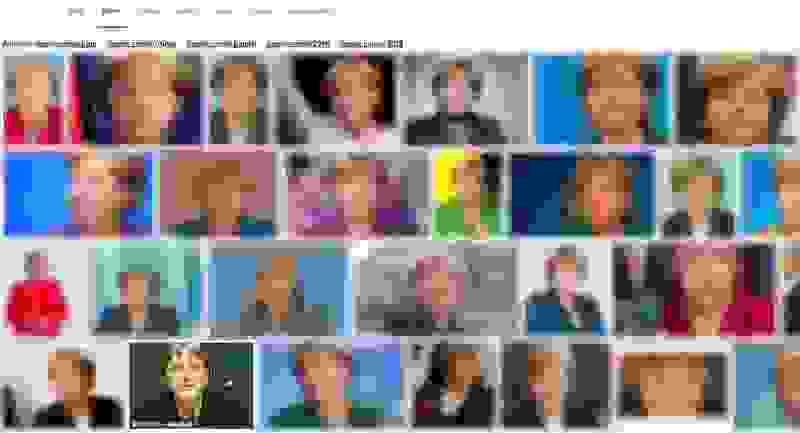 Most pictures on the top positions in the Google picture search rank with a maximum size of 1280×960, with 4:3 formats having a distinct advantage. Pictures often rank solely for keywords that are also present in the filename. If you have multiple terms in the filename, you should use the – to divide the terms. Try not to use _. Matt Cutts (former Head of Google’s Webspam Team) explains the difference between these two signs in the following video. You should add an individual alt-attribute to all pictures. This attribute also needs to contain the important keywords. A best practice would be a short description of what can be seen in the picture, which also contains the keywords. If you use the SISTRIX Optimizer , you will also get errors, warnings and tips for your pictures. Pictures without an alt-attribute and those which take too long to load are quickly shown, which enables you to specifically optimise these parts of your website. Good picture optimisation also means displaying relevant content near the picture. The desired keyword should be shown at least once in the surrounding content of the picture. Larger pages which have more relevant content for a picture usually manage to get better rankings in the Google picture search. With the SISTRIX Toolbox, you can check if pictures on your domain already rank within the picture search. You can sort the columns in the universal search module for the desired KPIs, if you like. Following that, you check the page with the pictures and make sure it follows the basics of a good picture optimisation and improve it, if necessary. In the SISTRIX Optimizer, you create a project for your website and let our crawler run an analysis, which you can then evaluate. The time it takes until any changes reflect on the rankings of your pictures can vary. It may take only a few days or even a few weeks.